When we write a list in Asciidoctor we can simply create a list item by starting the line with a dot (.). To create a another list item we simply start a new line with a dot (.). But what if we want to add a list item with multiple paragraphs, or text and a source code block element. 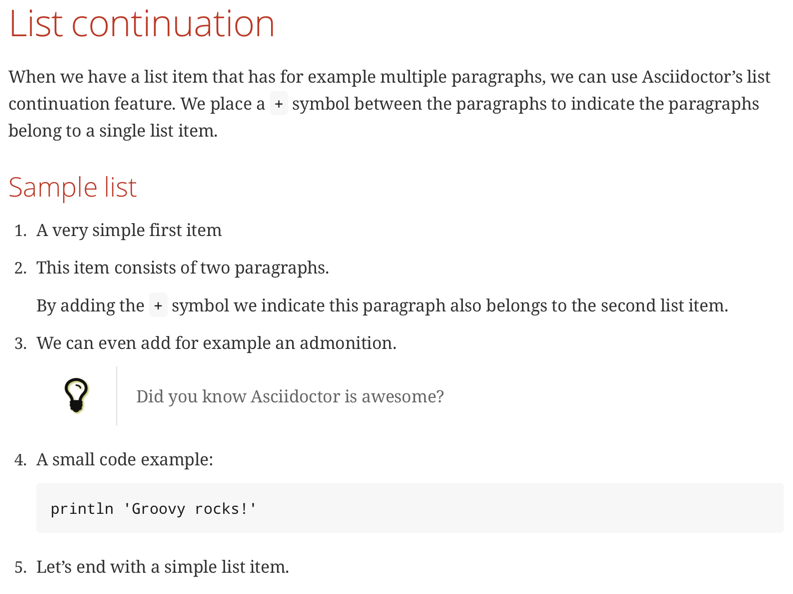 We can use the list item continuation (+) to indicate to Asciidoctor we want to keep these together for a single list item. belong to a single list item.
. This item consists of two paragraphs. paragraph also belongs to the second list item.
. We can even add for example an admonition. TIP: Did you know Asciidoctor is awesome?
. Let's end with a simple list item. We see how the extra paragraph, admonition and source code are part of a single list item.